The 2013 Las Vegas CES is upon us, and it seems that ASUS will be present and one of the protagonists of the event, building on the success of his commercial Nexus 7, made in collaboration with Google. And just on the front Tablet Asus will show its main news, which should consist of three new models: ASUS ME172V (tablet that resembles the economic Nexus 7 which we spoke a few days ago [photo]), ASUS ME371MG, (7-inch tablet with Atom cpu and Android Z2420 4.1) and ASUS ME570T, mysterious device appeared a few weeks ago in a photo's EXIF databut they still do not know practically nothing. 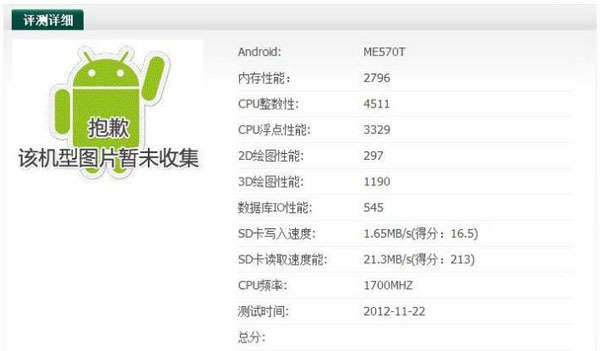 the specification of Asus ME570T could be in all respects of the successor to the Nexus 7, since it will mount a 1, cpu 1.7 GHz (most likely chip Tegra 3) and Android 4.1.1 Jelly Bean. We doubt that it can boast of trademark Nexus, since Google may want to wait more time between the release of a product and another, but Asus could exploit the experience gained in order to propose an alternative to the Nexus 7, at a reasonable cost and which go to make up the (few) defects of the product developed in collaboration with Google. Take, for example, integrating a camera back. What do you want from the new Asus tablet?